Introduction: Ganglioneuromas are rare benign masses that arise from neural crest cells. Intra-abdominally they can arise anywhere along the sympathetic nerve chain in the retroperitoneum and often remain clinically silent until they achieve a significant size. Surgical exploration is often necessary for diagnosis and treatment. A laparoscopic approach to this area can be challenging but may offer decreased pain, shorter hospital stay, and fewer wound complications. We present the case of a 26-year-old symptomatic male with a retro-portal, posterior pancreatic ganglioneuroma that was removed by laparoscopy. Methods: The patient was an otherwise healthy male complaining of one year of sharp intermittent epigastric pain, several bouts of hematochezia, intermittent reflux and early satiety. CT scan revealed a 3.2 x 4.5 cm mass posterior to the head of the pancreas and medial to the descending duodenum. The differential diagnosis at that time included pancreatic pseudocyst, primary cystic neoplasm of the pancreas, benign peritoneal cyst, and duodenal diverticulum in addition to ganglioneuroma. Upper endoscopy revealed a well circumscribed hypoechoic mass (4.7 x 4.4 cm). Endoscopic ultrasound directed FNA sample revealed atypical cells arising in a background of benign glandular epithelium. Results: A trans- abdominal laparoscopic approach was chosen to excise the mass. A laparoscopic Kocher maneuver exposed the cystic retroperitoneal mass which was located posterior to the portal vein, anterior to the vena cava and extending medially to the celiac axis. It was well encapsulated and was completely excised with the harmonic shears. There were no postoperative complications and the patient was discharged to home on postoperative day one. Gross exam revealed a rubbery mass without areas of hemorrhage or necrosis. Microscopic examination revealed myxoid and spindle cell proliferation. Immunohistochemical stains confirmed the diagnosis of ganglioneuroma. On follow-up the patient reported resolution of the previously noted symptoms. Conclusion: We report a minimally invasive approach to a retro-portal/ posterior pancreatic head ganglioneuroma. 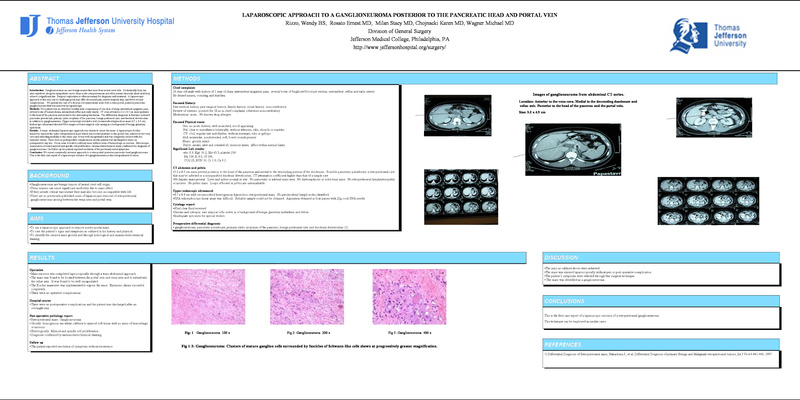 This is the first case report of a laparoscopic excision of a ganglioneuroma in this retroperitoneal location.